Harmony Farm Supply and Nursery for just about everything needed for fruit gardening, on Hwy 116 just North of Sebastopol. They offer a 10% discount on plant-materials and some irrigation supplies for CRFG Redwood members. You will need to provide your name and phone number for comparison to our membership list in order to get the discount. Harmony provides irrigation supplies & design, solar supplies & design, a full range of organic vegetables and flowers, nursery stock well adapted to our local climate, and edible landscape design services. Harmony promotes community-supported organic and sustainable agriculture at home, on the farm, and with a special program for school gardens. Prickett’s Nursey, at the corner of Calistoga Road and Hwy 12, with weekly specials 707-539-3030, with a wide selection of indoor and outdoor plants, pottery, soil amendments, Xmas trees, and pruning service. Denise Baxter, owner. Healdsburg Nursery is a complete full service garden center that prides itself on the quality and selection of their products as well as their friendly and professional staff to assist you in any way necessary. Bloomfield Bees Honey offers raw honey and bee-based medicinal cosmetics from Sebastopol, Sonoma County, CA. Bloomfield Bees Honey is committed to ‘bee-yond organics’ apiary practices and to offering the very finest in creamed, chunk and raw honey. Sebastopol Hardware Center, a West Sonoma County full-service hardware store. “Service, convenience and selection in a one-of-a-kind store”. Talk to Mike Bishop or anyone in the store for help. Stony Point Rock Quarry Producers of Soils Plus topsoil products, with custom blends available, family owned since 1973. Ask for Randy Swegle, site manager, for advice. Slow Food Russian River “a non-profit, eco-gastronomic organization that supports a bio-diverse sustainable food supply, local producers, heritage foodways, and rediscovery of the pleasures of the table”.(Whew!) Slow Food and CRFG-R share a number of members in common, ideals in common, and are mutually supportive at respective events. They have local chapters around the world, just like CRFG. They also support the Renewing America’s Food Traditions (RAFT) program with its Forgotten Fruit initiative. 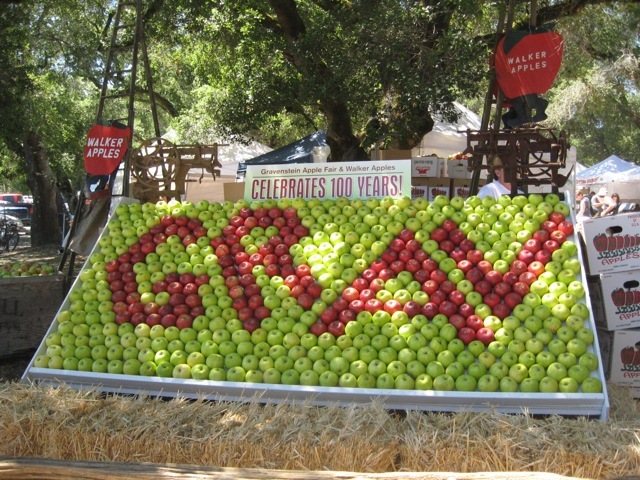 Gravenstein written in apples. 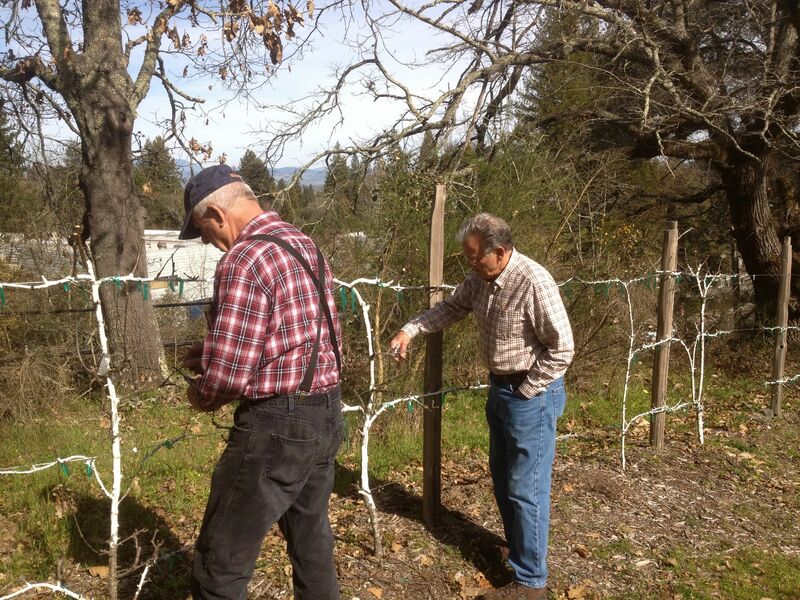 Burbank Gold Ridge Farm for hosting our espallier apple fence, being a source of scions, allowing us to use their park for meetings, and doing their own work to propogate and retain heritage trees and plants. CRFG also planted and manages an espallier fence of Burbank varieties there. Oldies and Goodies Organic Plant Starts. Wholesaler specializing in organically grown heirloom and other outstanding food plants and flowers. Contact Lena at 707-823-5206. Nana Mae Organics Members Paul and Kendra Kolling tend over 400 acres of 25 varieties of heirloom apple varieties throughout Sonoma County for over 100 different landowners. Kendra is also active on the Slow Food Gravenstein committee. Their apples, apple juice, applesauce, cider-vinegars and other products under the Nana Mae label (named after Paul’s grandmother) are available at stores and farmers’ markets throughout the Bay Area. Paula Downing, manager of a number of the Sonoma County Farmer’s Markets, for supporting CRFGR through donations of space at the markets for our annual plant sales, and a cash donation to support the CRFGR Cider Press demonstrations for Slow Food. Whole Foods Market in Sebastopol offering quality natural, organic and local food products, and lots more (including donations for our raffle at the scion exchange). Sonoma County Nursery Tour and Gardener’s Resource Guide speaks for itself. Nice website and articles. Supporter of CRFG-R. Sustainable Seed Company is based outside Petaluma, offering the finest quality organic and heirloom seeds, a raffle-donor and participant in CRFG-R.
Baker Creek Heirloom Seeds with a store in Petaluma, offering 1400 kinds of heirloom seeks, a donor of seeds to our scion exchange. United Forest Products – is a local producer of ground covers and amendments, and a donor in support of our raffles. DeLoach Vineyards and Winery for the hospitality at their facility use for our meeting, and donation to the Scion Exchange raffle. Ace Cider is kind enough to repeatedly host our fall apple tasting events. They sell many kinds of local hard cider.